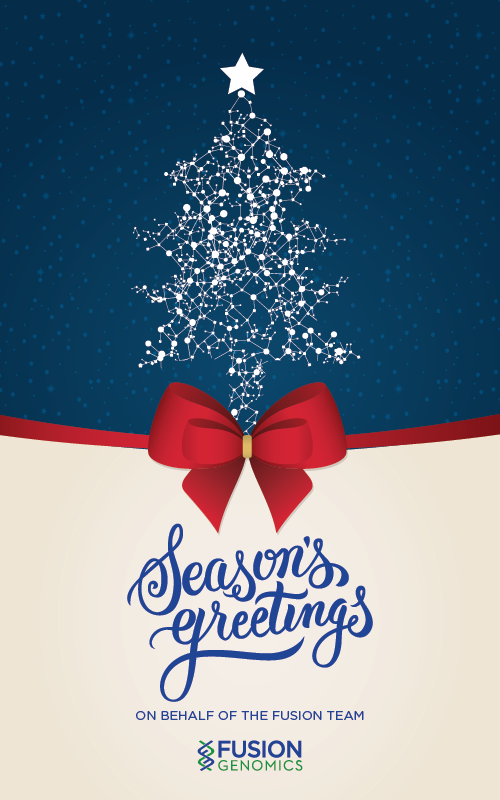 Season’s Greetings | Fusion Genomics Corp.
As we celebrate this holiday season we thought we’d take a moment to tell you about some of the wonderful things that FUSION GENOMICS accomplished in 2016 and what we’d like to see happen in 2017. As you know, FUSION’s mission is to develop simple-to-use molecular diagnostics for infectious disease pathogens that are responsible for major global health problems. In doing so, we aim to establish new paradigms for how diseases are surveyed, monitored and treated in the hopes of preventing future epi- and pandemics and saving lives. First and foremost, we now have 3 ONETest™ assay kits that are market ready and available for purchase, ONETest™ Influenza Sentinel, ONETest™ Influenza EnviroScreen, and ONETest™ Hepatitis. We also further developed and optimized our FUSIONCloud™ online bioinformatics data analysis platform and it is now ready to analyze the sequencing data from all our ONETest™ kits and rapidly deliver the answers our clients are seeking. FUSION GENOMICS also had several important presentations this past year. We were proud to have a poster of our ONETest™ Influenza Sentinel showcased at the Options IX for the Control of Influenza annual conference in Chicago this year (Embedding next generation sequencing in influenza surveillance and influenza vaccine effectiveness studies, season 2015/2016, the Netherlands, by Meijer A, de Lange M, Donker G, Overduin P.). In August, a scientist from BC presented a paper at the 65th International conference of the Wildlife Disease Association in Cortland, NY (Genomic analysis of wetland sediment as a tool for avian influenza surveillance and prevention) which used our ONETest™ Influenza EnviroScreen to identify bird flu in wetlands and small water bodies on infected farms. FUSION’s CEO, Mohammad Qadir also gave a talk, (ONETest Molecular Diagnostics for Infectious Diseases) in Toronto at the Tenth National Microbiology Diagnostics Users Group Fall Meeting and Annual Conference 2016 which generated a lot of excitement in our approach, products and FUSIONCloud™. January 9-12, FUSION will be at the JP Morgan Annual Healthcare Conference to be held in San Francisco, 2017. January 14-18, FUSION will also be in San Diego at the International Plant & Animal Genome XXV Conference. January will be a busy month for us! FUSION was also pleased to be able to expand both our Bioinformatics and Laboratory Teams with 2 new employees each. Happy Holidays and New Year to all our friends and wishing you a great 2017!